The backyard can be fun and full of surprises for our canine friends to enjoy. But don't let one of those surprises be a trip to the veterinarian. 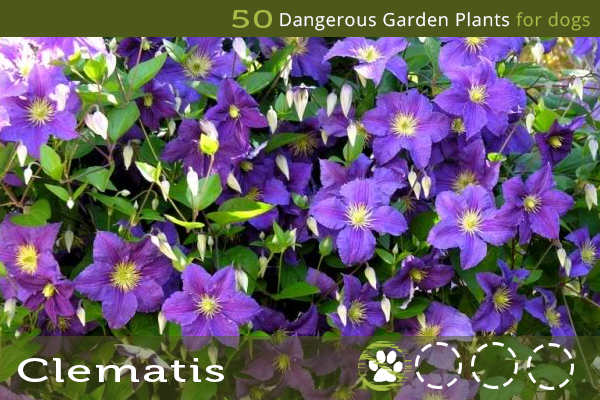 Keep your yard and garden safe for dogs by avoiding these plants, flowers, shrubs, and trees that could make them very sick. Or, at the very least, plant them with caution and always supervise your pet. ***WARNING: This list is meant for general information purposes only, including the toxicity scale. It is by no means to be replaced for qualified veterinary advice. If your pet could have possibly ingested any of these plants, you should call your vet immediately. A lovely herb often used in teas and in aromatherapy for soothing and calming nerves, the chamomile plant is toxic to dogs. 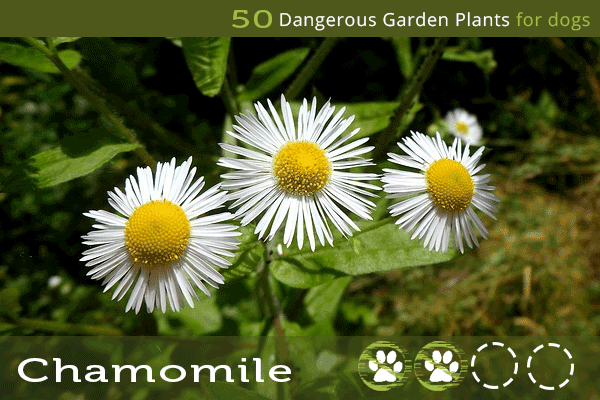 While chamomile is safe in products for dogs, you want to avoid your dog's contact with the actual plant. Possible symptoms: Contact dermatitis, vomiting, diarrhea, anorexia, allergic reactions, bleeding tendencies (long-term use). Source. 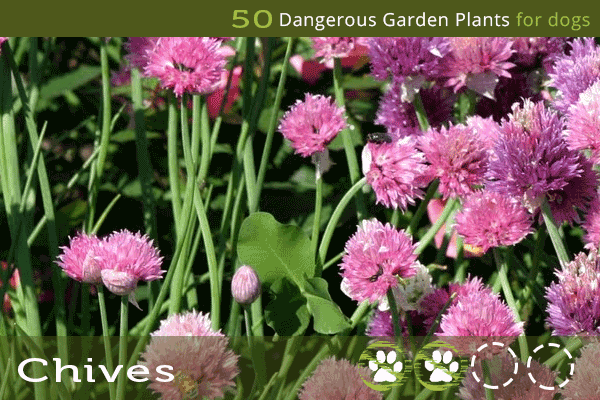 Chives, along with others in the Allium family, such as onions and garlic, can be quite harmful to dogs when ingested. While they can tolerate low doses (as you'll find some flavouring in pet treats), it is best to avoid these plentiful herbs whenever possible. Possible symptoms: Drooling, nausea, oral irritation, vomiting, diarrhea, lethargy, abdominal pain, elevated heart rate and respiratory rate, weakness, exercise intolerance, collapse, pale gums Source. 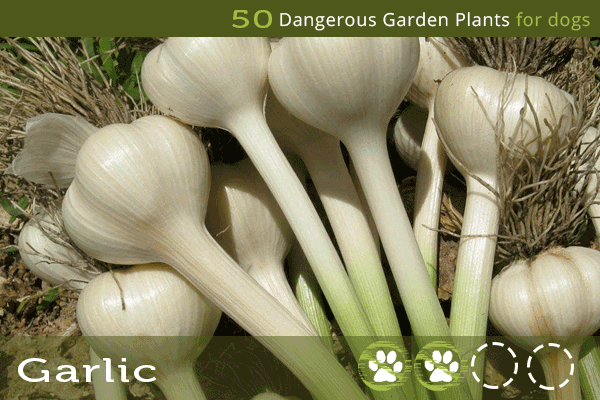 A member of the Allium family, just like chives, garlic is delicious, but can be mildly to moderately dangerous for dogs. Once again, dogs can tolerate some garlic, but many love the taste and may desire more than they can handle. Keep under close watch, as garlic is about 5 times as toxic as onions. 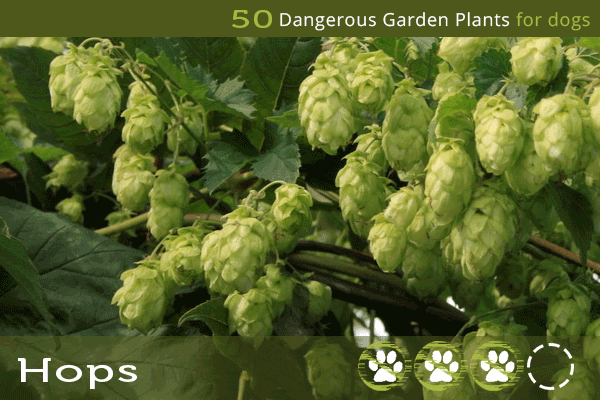 With home-brewing on the rise, you may need to watch out for hops growing in backyards. The plants are enormous climbing vines, so they should be easy to spot. The effects can be quite severe, with dried hops being the most toxic form. Keep any home-brewing materials and leftovers safely contained - hops can be hazardous whether fresh, dried, or cooked (spent hops). Possible symptoms: panting, high body temperature, seizures, death. Source. Another, slightly less popular member of the Allium family, leeks make a delicious addition to soups and many other dishes. However, just don't feed them to your dog. 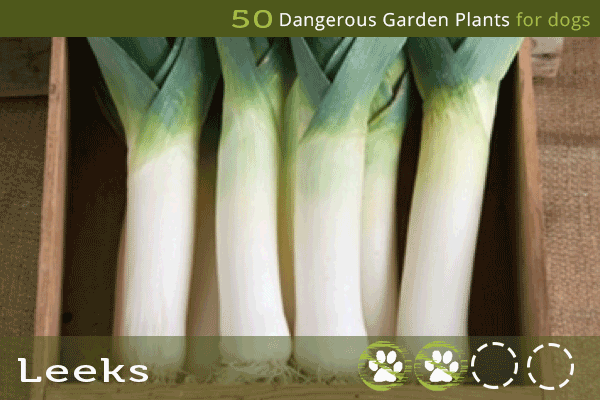 Like other members of the onion family, they can cause some very uncomfortable symptoms for dogs. 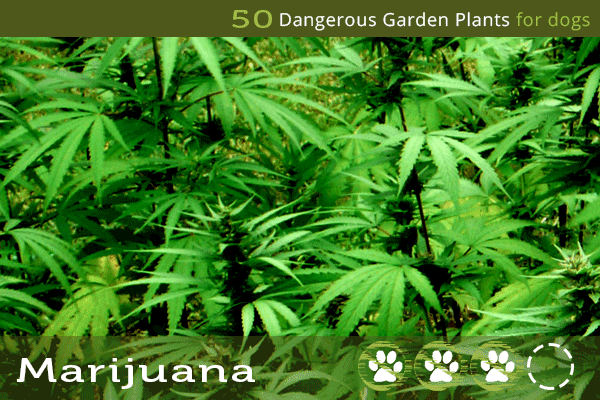 With marijuana legalization a hot topic, and the prevalence of medical use, you should take precaution that your dog does not come across the live marijuana plant or dried cannabis in any form. Symptoms can be mild to moderate, and even include death. Possible symptoms: Prolonged depression, vomiting, incoordination, sleepiness or excitation, hypersalivaton, dilated pupils, low blood pressure, low body temperature, seizure, coma, death (rare) Source. 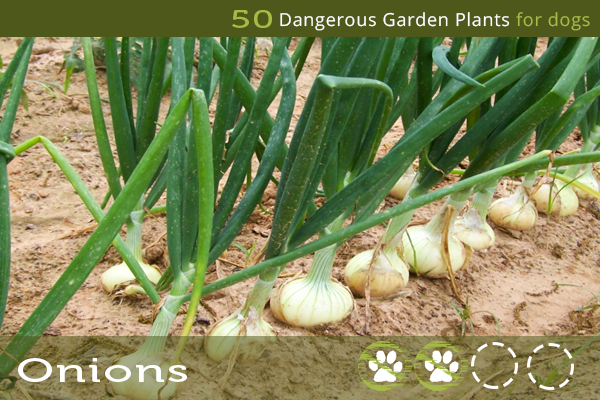 A popular seasoning vegetable, onions (and the less common shallots) are a staple for many gardens. However, extra caution if you have dogs (or cats, who are even more susceptible to toxic effects). 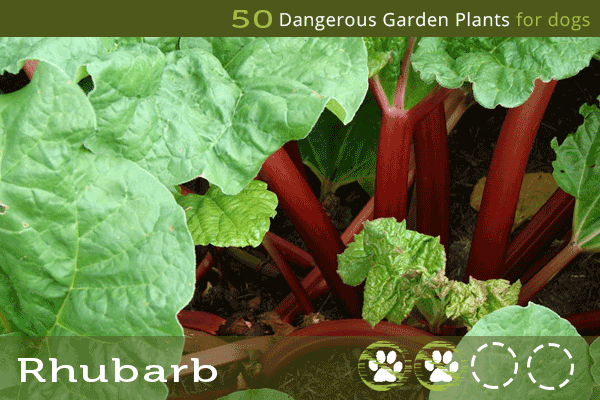 An early spring perennial, rhubarb is delicious when added to pies, crips, and other baked treats. However, the leaves (and less so, stalks) contain oxalate crystals, which can wreak havoc with your dog's urinary tract. They're also poisonous to people, so always be careful when handling. Possible symptoms: Drooling, loss of appetite, vomiting, diarrhea, lethargy, weakness, tremors, blood in urine, changes to thirst and urination Source. 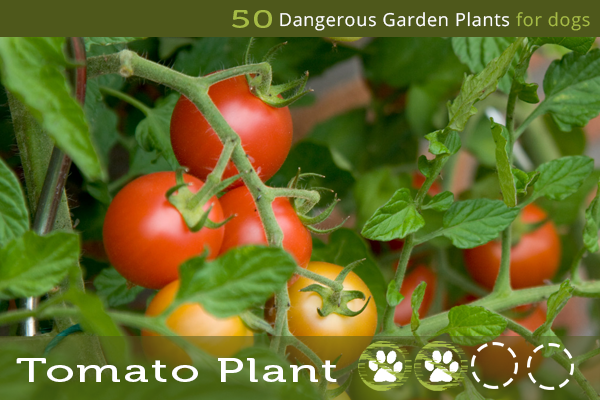 Tomatoes are a vegetable garden favourite, but grower beware. A member of the nightshade family, tomato vines and leaves can cause some worrying symptoms in pets (and people, too). Possible symptoms: Hypersalivation, inappetence, severe gastrointestinal upset, diarrhea, drowsiness, CNS depression, confusion, behavioral change, weakness, dilated pupils, slow heart rate Source. 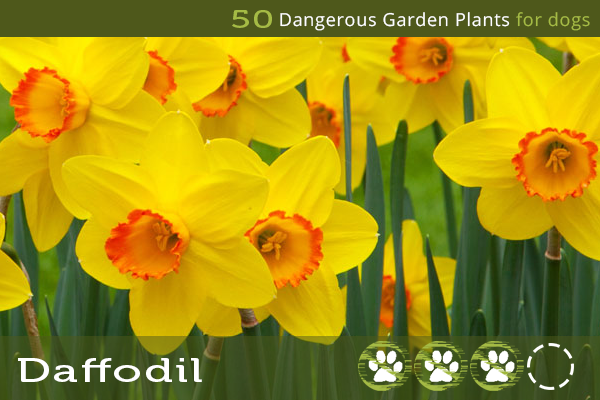 Sometimes also called the Narcissus, these Lily-family bulb plants can be dangerous to both dogs and cats, but is not as dangerous as true lilies. Toxins can be found in the leaves and stems, and are most concentrated in the bulbs. Possible symptoms: Drooling, vomiting, hypotension, respiratory depression, abdominal discomfort Source. 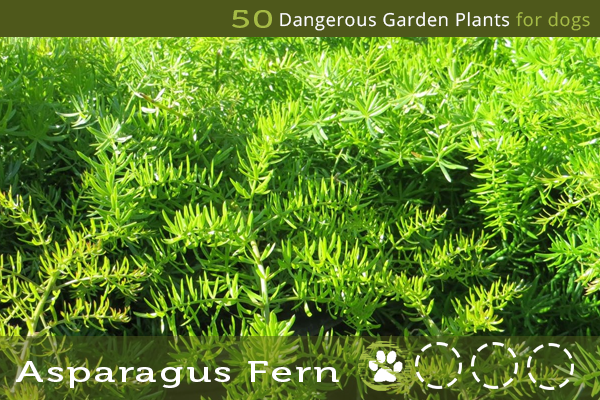 Usually found indoors as an ornamental plant, but sometimes outdoor in the summer, the Asparagus Fern can make your pet feel uncomfortable if exposed through touch or if ingested. Also called the Emerald Fern or the Lace Fern. Possible symptoms: Allergic dermatitis with repeated exposure, gastric upset from berry ingestion (vomiting, abdominal pain, or diarrhea) Source. 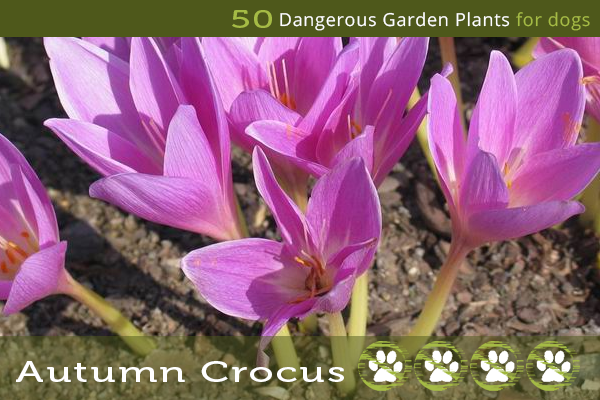 Not to be confused with the more common spring Crocus, the autumn-blooming crocus can cause very severe gastrointestinal upset and even respiratory or kidney failure and death. The spring Crocus can still cause gastrointestinal upset, but the symptoms are usually mild. Possible symptoms: Drooling, vomiting, diarrhea, loss of appetite, bloody diarrhea, black-tarry stool, organ damage, respiratory failure, seizures, death Source. These bright perennials (annuals in cool regions) are numerous in variety and very popular as a garden plant and even an indoor plant. However, they can cause some very uncomfortable symptoms in pets if they are ingested, particularly the highly toxic tubers. Possible symptoms: Oral irritation, intense burning and irritation of mouth, tongue and lips, excessive drooling, vomiting, difficulty swallowing Source. This flower is a garden flower, prized for its versatility in cut flower arrangements. A member of the carrot family, it can cause pain and other worrying symptoms if ingested or touched. 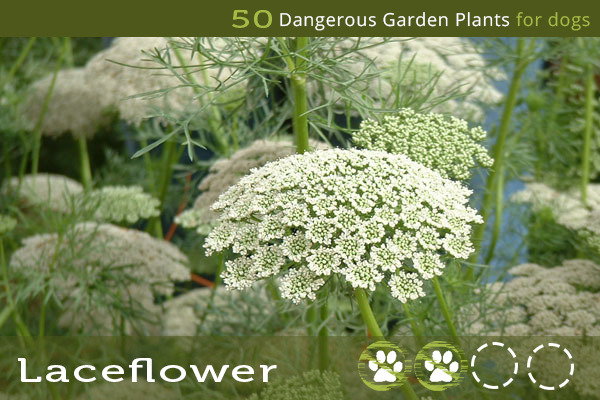 Also called False Queen Anne's Lace, Bishop's Weed, Queen of Africa, or Greater Ammi. This popular shade-loving garden flower is a beauty in the spring, but if ingested, it's been linked to digestive upset and tremors. Possible symptoms: Vomiting, diarrhea, staggering, tremors Source. 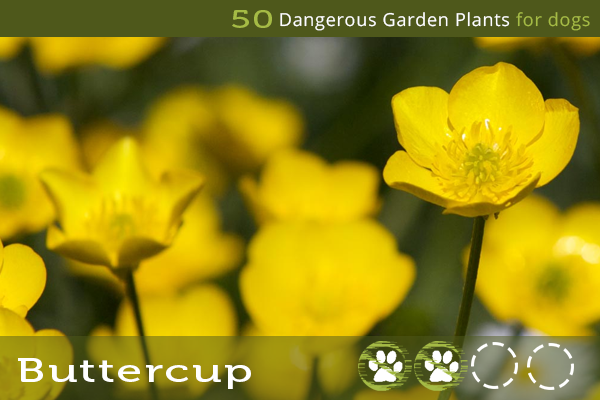 While most of the varieties are seen as weeds, buttercups have pretty flowers and can be found quite commonly in gardens and lawns and growing wild in certain regions. The buttercup is unpleasant should your pet happen to consume it. Fortunately, siince it does cause painful mouth blisters, usually pets do not consume enough to do lasting harm. 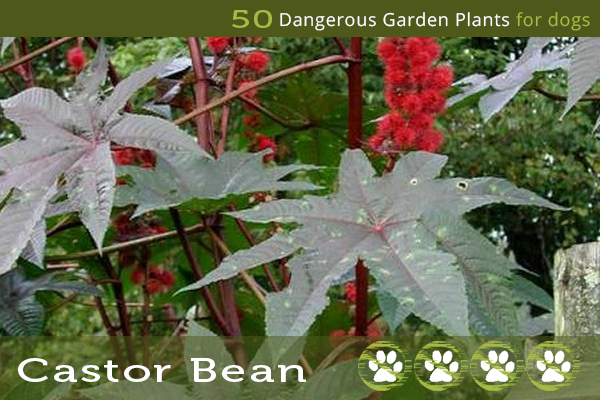 The castor bean plant is a big, beautiful ornamental if you live in a warm enough climate to sustain one year-round. However, the deadly toxin ricin can be found within the beans (seeds). 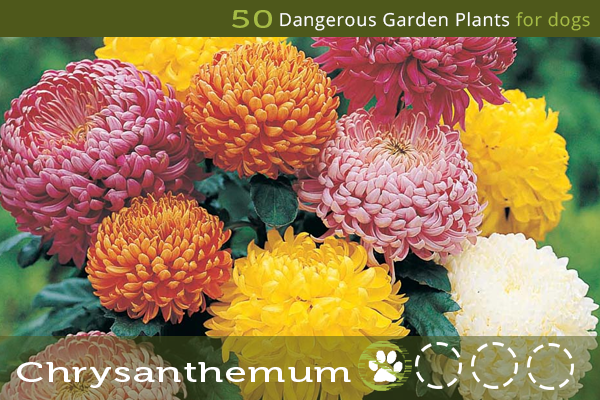 These lovely annuals, commonly called 'mums', are popular in gardens and as house plants or cut flowers. When ingested by pets, they usually have a mild effect, but it is worth noting considering their popularity. The toxin they contain, pyrethrins, is used in dog tick and flea medications. This gorgeous vine produces large, star-shaped blooms. The plant has a bitter taste, so your pet is unlikely to ingest a lot of it. 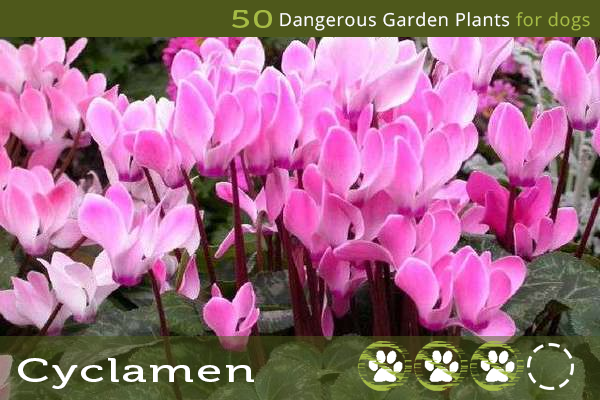 Cyclamen is a popular houseplant with unique upswept flowers and beautiful variation in their leaves, but they're also dangerous for dogs and cats. The tubers are the most poisonous, and can result in seizures, heart problems, and even death when consumed in large quantities. Popular in the early spring around Easter, the daffodil may cause a severe reaction in your pet, so it's best to see a veterinarian if your pet ingests it, particularly the bulb. 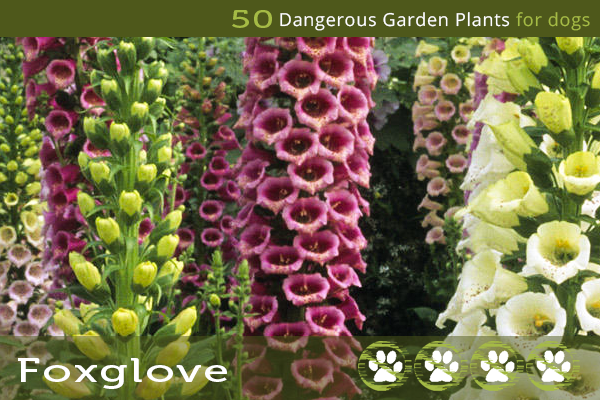 The foxglove may be beautiful, but all parts of the plant are very toxic for dogs, cats, and even humans to consume. The ever-popular geranium comes in many different colours and varieties. 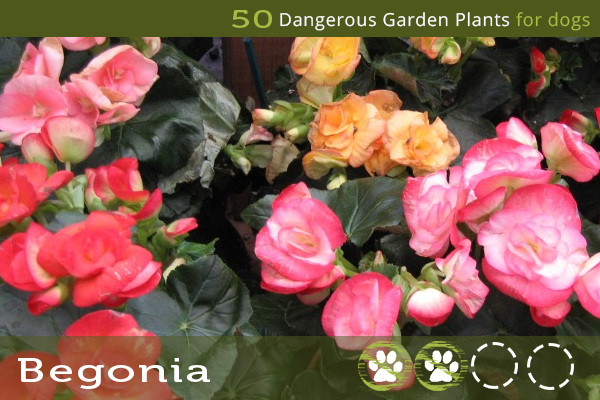 There are two species of geraniums, each of which has countless cultivars. 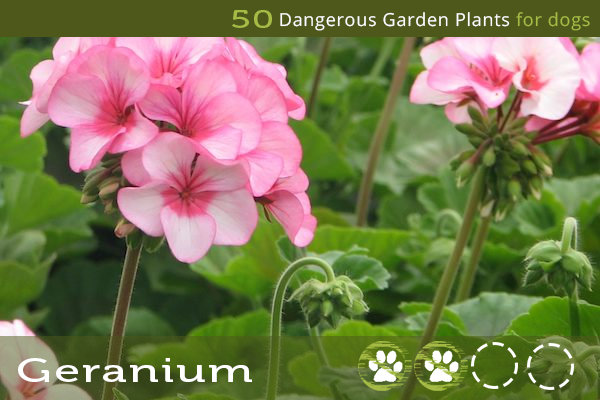 The Geranium genus is safe (also called Cranesbill), but the Pelargonium species is toxic for pets. Gladiolas make quite a presence in gardens with their impressive stalks of large blooms. The perennials also spread quickly through seed. Like most bulb flowers, the highest concentration of toxin is in the bulb or corm. 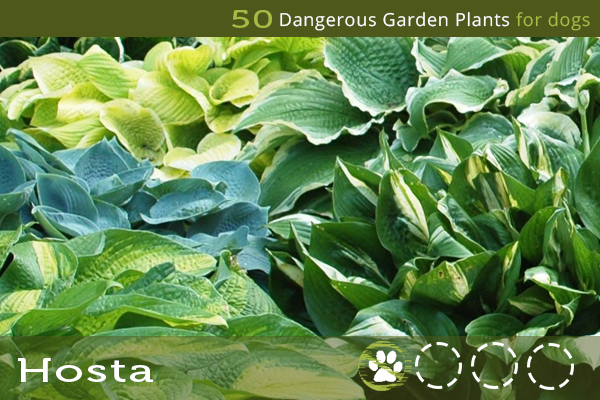 A common shade-loving plant, the hosta comes in many different cultivars that can vary widely. 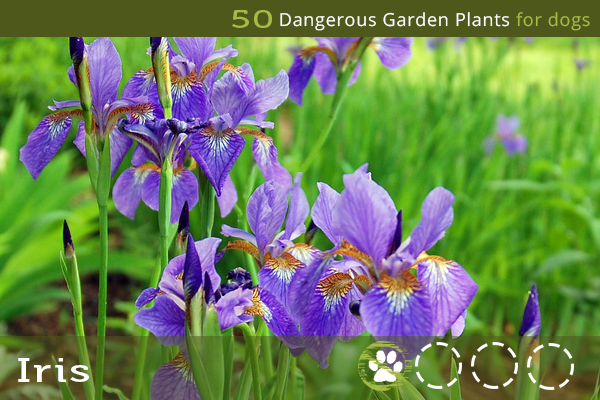 The common name for all flowers in the iris genus, irises have beautiful, bright coloured blooms that can cause issues for pets if ingested. 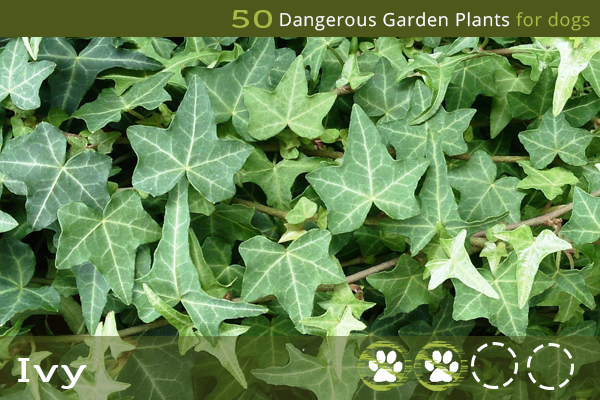 English Ivy, also called Needlepoint Ivy, Sweetheart Ivy, Glacier Ivy, or Branching Ivy, will cause your pet to experience uncomfortable symptoms if consumed. The leaves are more poisonous than the berries. 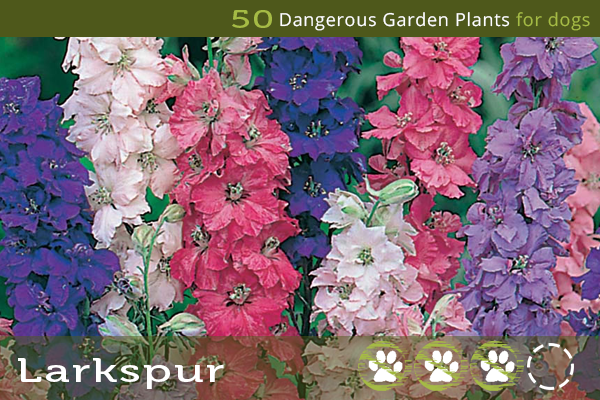 Larkspur, sometimes called Delphinium, can cause some very worrying symptoms in pets. 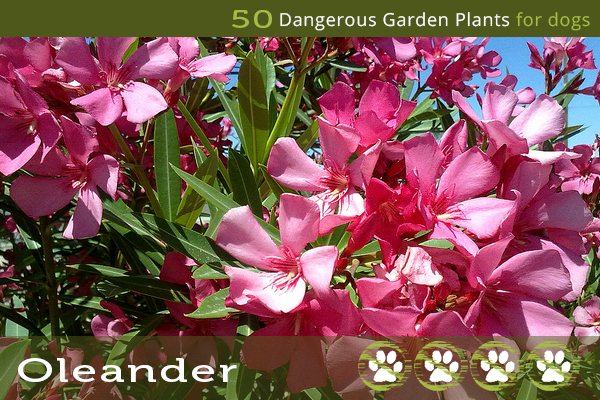 The plant loses toxicity with age and certain seasons, but should be avoided at any rate. 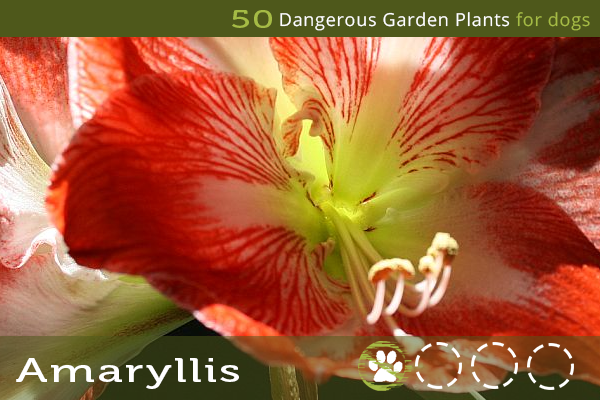 There are so many varieties of lilies, and while most of them are incredibly toxic to cats, only a few are poisonous for dogs. 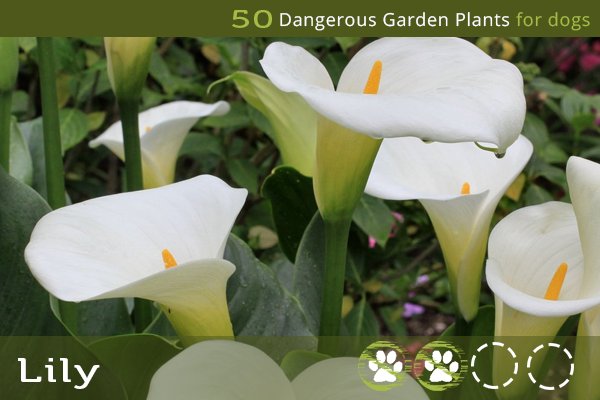 Calla Lilies, Peace Lilies, and Palm Lilies are all toxic to dogs. These plants are rarely seen outdoors out of sub-tropical or tropical climates, but are popular indoor houseplants. 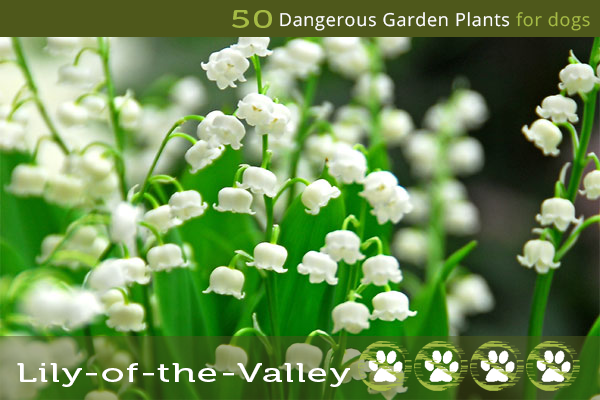 A popular shade flower that can spread quickly, Lily-of-the-valley is a beautiful and fragrant flower, but can produce very serious symptoms in pets and people. Watch out especially for the orange-coloured berries, which are the most toxic. 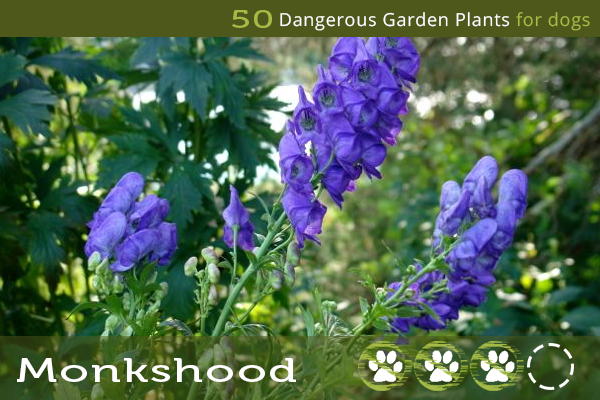 Also called Aconite or Wolfsbane, Monkshood has gorgeous, purple sculptural blooms, but it is poisonous to humans and pets, and should be planted with caution. 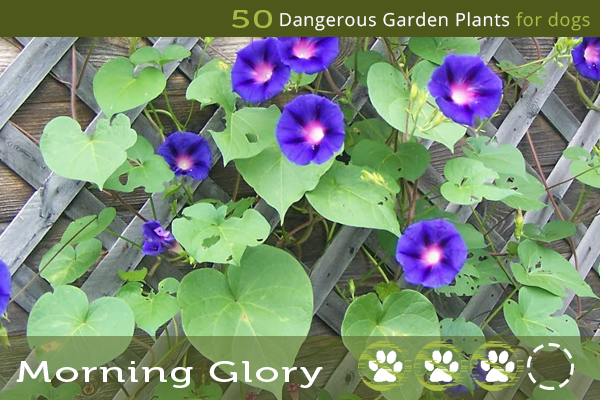 A lovely climbing vine, the morning glory is quick-growing with purple trumpet-shaped blooms. 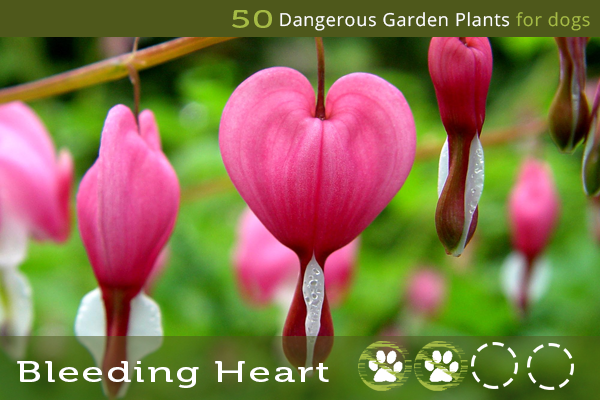 If large amounts are ingested, particularly the seeds, the plant can be very toxic. 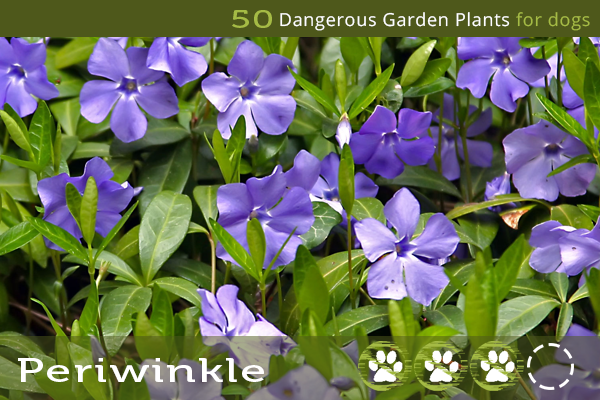 With its small namesake blue or pink flowers, periwinkle makes an attractive ground-cover plant, but it can be quite toxic, even resulting in death (rare). 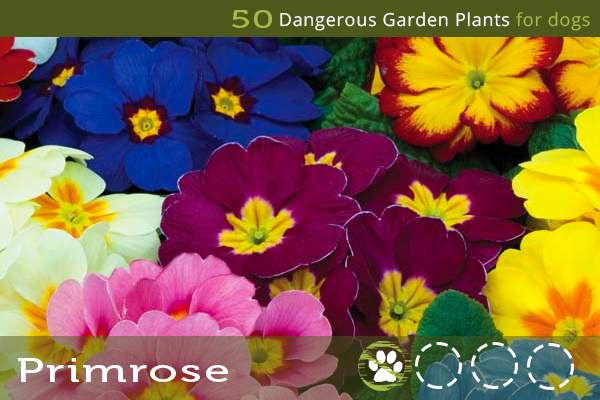 The primrose comes in many different colours and contains an unknown toxin that produces mild effects in pets. 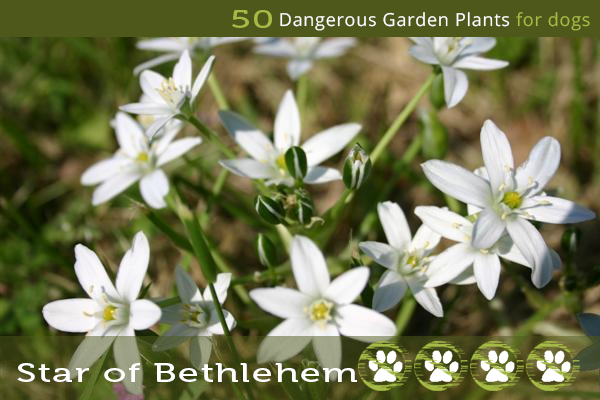 A beautiful star-shaped flower, the Star-of-Bethlehem contains a toxin that behaves similarly to a common heart and veterinary medicine, digitalis or digoxin. 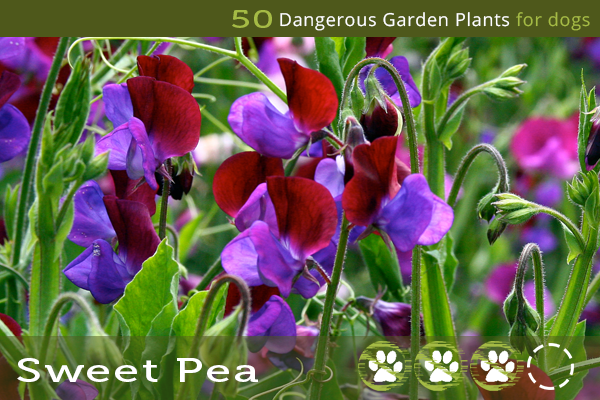 A common vine with multi-coloured flowers, the sweet pea can be hazardous to dogs and other animals when ingested, particularly in large amounts. 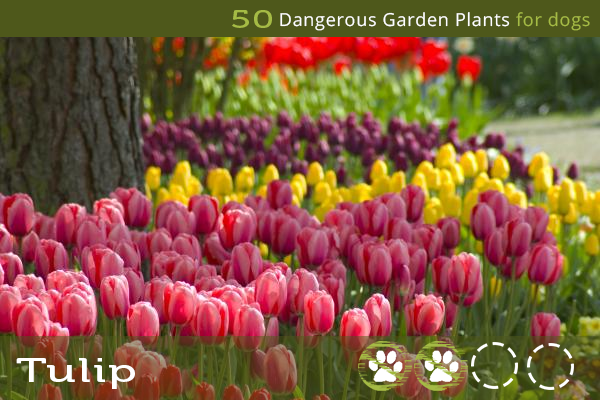 Tulips are everywhere in the springtime and a garden staple. 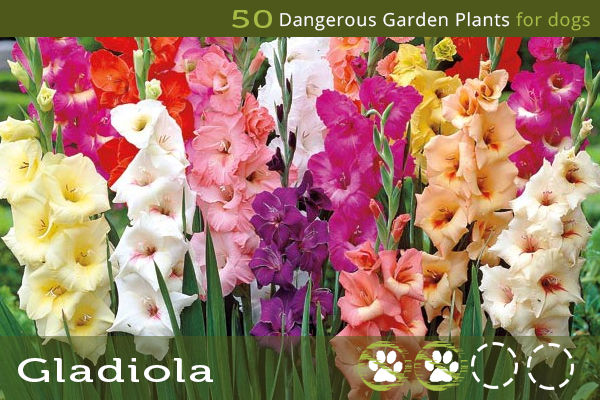 But, you should be cautious with them around your dog, particularly the bulbs, which are the most toxic. 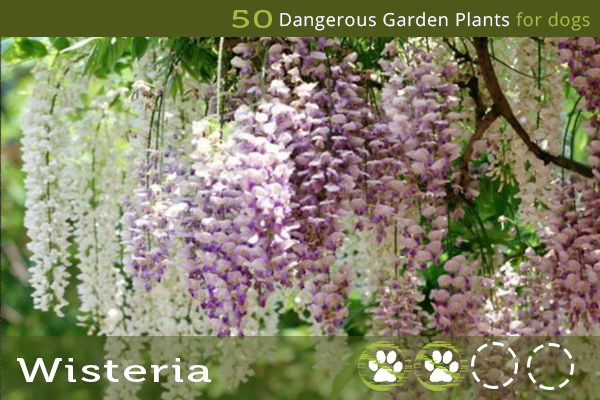 A cascading climbing vine in the pea family, Wisteria contains a few toxic compounds that can affect pets. 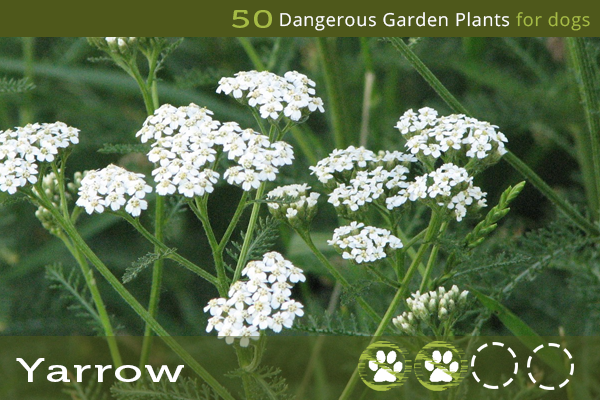 A common and easy-spreading garden perennial, yarrow contains several toxic elements that can make your pet quite uncomfortable if ingested. 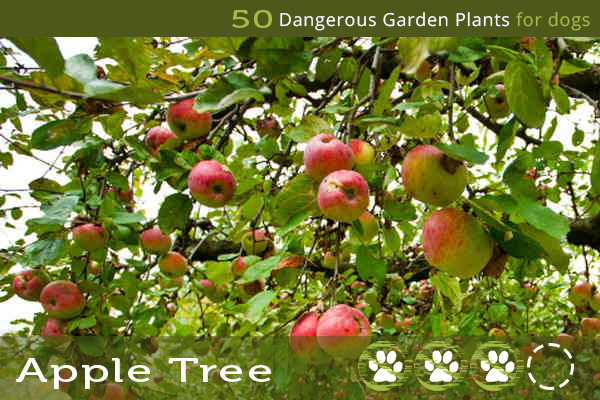 Apples are a tasty treat for dogs, but some parts of the apple tree (including crabapple trees) pose some risk to dogs as a toxin. The leaves, stems, and seeds all contain cyanide, and are particularly toxic when they are wilting. 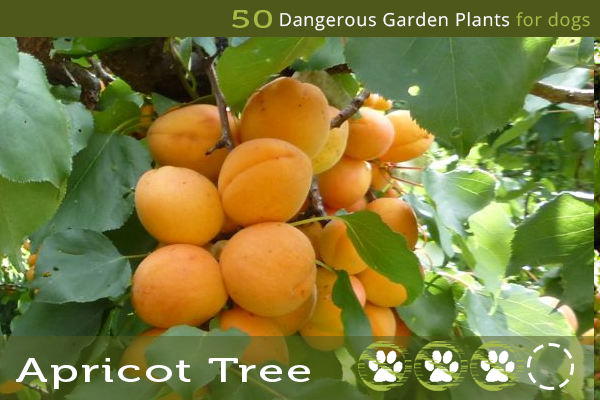 Apricots are safe for dogs to eat, as long as you remove the pit. But similarly to apple trees, the leaves and stems of the apricot tree contain cyanide, in higher concentrations if they are wilting. 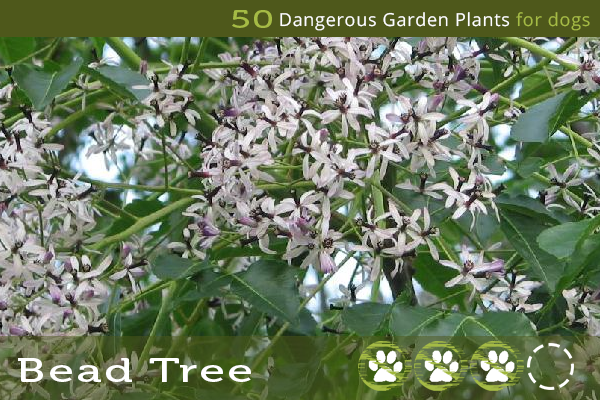 Also called Chinaberry Tree, Indian Lilac or White Cedar, this unique tree with star-shaped lavender blooms and yellow globe fruit can be very harmful to pets if ingested, especially in large quantities. The highest concentration of the toxin is in the fruit. 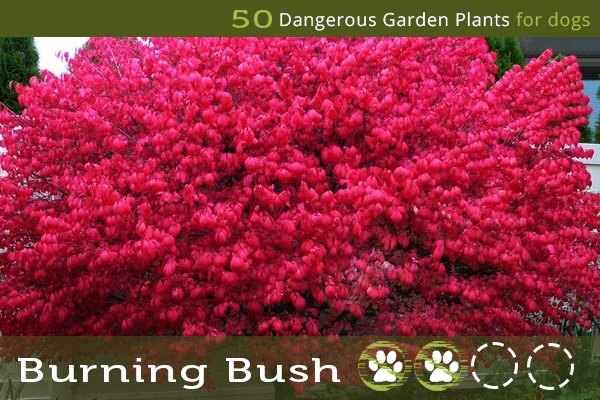 A garden ornamental with bright red leaves in fall and pink and orange berries, the Burning Bush makes a stunning addition to the yard. 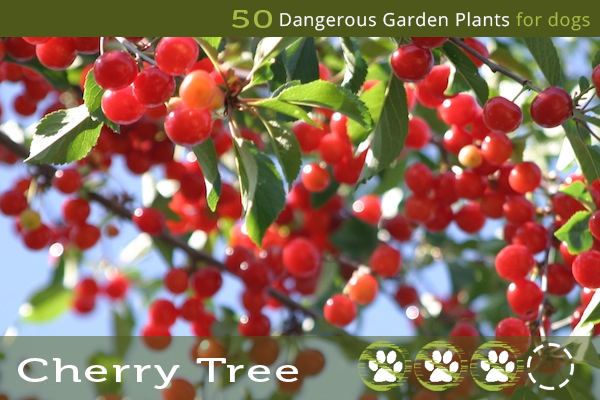 However, the plant is an invasive species in certain areas, such as Massachusetts and New Hampshire and can also be toxic to dogs cats, and even humans, particularly the berries or seeds. Like apple and apricot trees, leaves, stems, and pits of all kinds of cherry trees contain cyanide. Pay particular concern if the leaves are in the wilting stage. 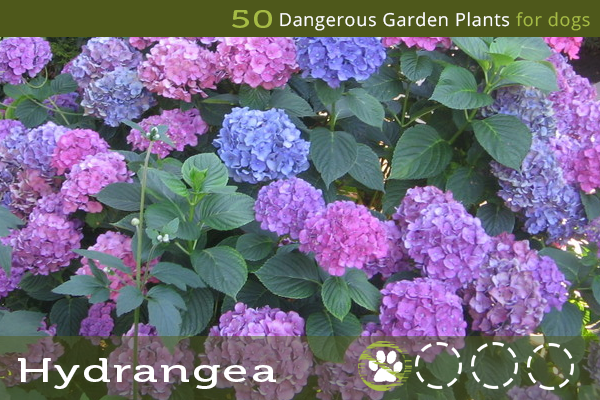 Hydrangea is a decorative garden shrub with tight globe-like clusters of blue, purple, or pink flowers. It is also a common cut flower or houseplant. The leaves and flowers are the most toxic parts. 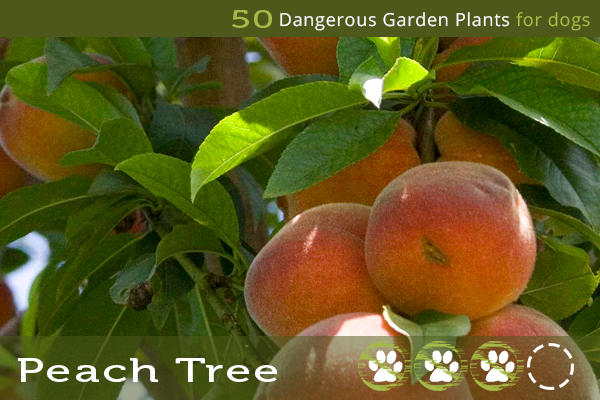 Like apple, cherry, and apricot trees, leaves, stems, and pits of peach trees contain cyanide. They are even more toxic if the leaves are in the wilting stage. 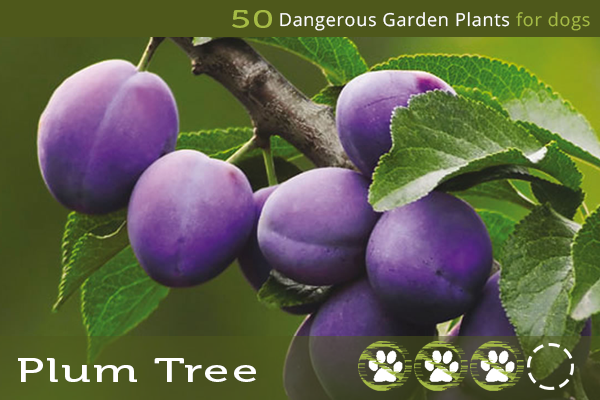 Like apple, cherry, peach, and apricot trees, leaves, stems, and pits of all kinds of plum trees contain cyanide. and are most toxic when the leaves are in the wilting stage. You may not have to worry about this evergreen hedge shrub unless you are in a warm enough climate for it to grow, which excludes most of Canada. 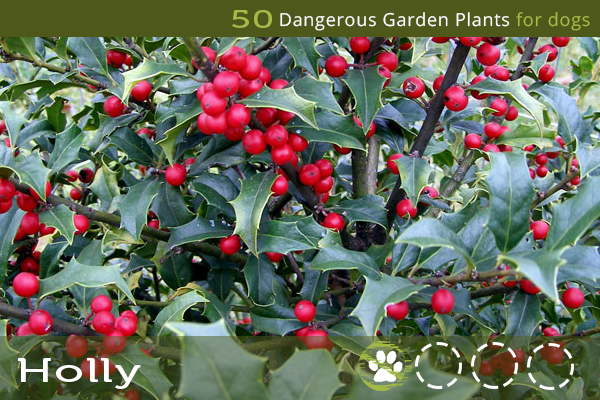 However, many kinds of holly can be found indoors during the winter months, as people decorate for Christmas. 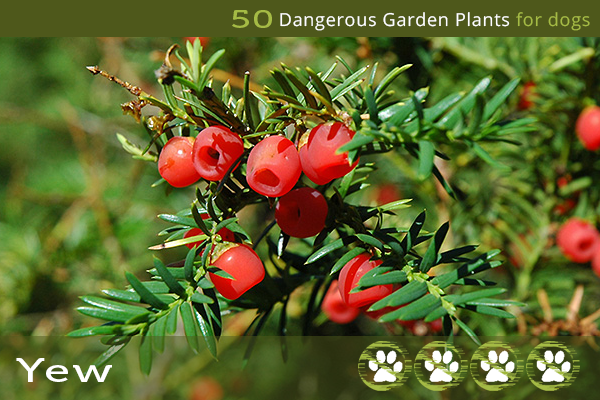 A common evergreen with many variations, the yew tree or shrub is extremely toxic to dogs, humans, and many other animals. The genus name, Taxus, is even where we get the term "toxic" from. Avoid planting it in your garden.